Every time an election looms, lawn signs spring up like so many cardboard weeds, expressing the sentiments of homeowners, triggering heated arguments over backyard fences and creating useful B-roll for local news programs. Since 1984, use of lawn signs has quadrupled. But are they effective? There’s no doubt they enhance visibility and brand awareness. But as most politicians have discovered, signage campaigns which rely exclusively on lawn signs won’t be very effective unless they are coordinated, worded correctly, and used as part of a broader campaign. Whether you’re running a political campaign or selling tires, signage is essential. Brand awareness is the foundation of success. Sure, you’re good at what you do, but if you want to succeed, you need to tell people about it. Politics is not a game for the humble. 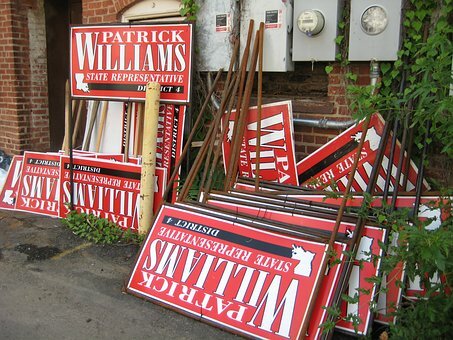 While your campaign may include television, radio, and public appearances, the first step is always signage, serving as a grass-roots foundation for the entire campaign. Political campaign offices are often housed in temporary quarters where volunteers and staffers keep the office buzzing. But that office is more than just a functional location for making phone calls and serving as a coffee-and-bathroom-break location for volunteers in between their door-to-door campaign duties. An occasional citizen may stroll in to get information, but for the most part, these offices are for staff business. But that doesn’t mean the office itself shouldn’t be a focal point of visibility for passers-by. Since a campaign office is meant to be temporary, permanent signage is out – but you can still transform the office into a billboard with a low-cost three-by-six foot vinyl banner, which can be easily installed, changed out for multiple messages, and taken down when the campaign is over. On average, you have about six seconds of attention for your billboards. There is a lot of signage real estate available, but the message still needs to be very brief. Avoid trying to use it as a direct response vehicle with phone numbers, addresses and URLs. Rather, billboards are best used for quick and memorable messages and brand recognition. Advertising people recommend that the billboard contain no more than six words – and while this is only a general rule of thumb that can certainly be bent, keeping verbiage to a minimum is going to get the message across better. Compared to banners and signs, billboards are expensive, but there’s nothing like having your message in a 14 by 48 foot format in multiple locations for visibility. A digital billboard is even costlier, but carries the advantage of being able to switch your messages out every few minutes. They are easy to distribute, inexpensive to produce and are great for grass-roots, neighborhood campaigns. Their smaller size makes them more ideal for residential areas and busy intersections. Like the billboard, verbiage should be kept to a minimum. For durability, corrugated plastic will be superior to other varieties and better able to withstand the weather. Most of all though, it requires coordination of volunteers to distribute and place signs. Even if the yard signs are able to sway the election by only a percent or two, as any politician knows, often that’s what it comes down to when winning an election. From yard signs to billboards, the rules are the same. Keep the verbiage to a minimum. Think of signage as a way to increase your brand, rather than as a way to convey detailed information. It only takes a few words in easy-to-read fonts and possibly a simple logo. Your campaign will ultimately include many different types of advertising, but it all starts with increasing brand awareness.